Please email me with orders and I will send you a price estimate and let you know if I have time to do it if you want custom jewelry items made - I do custom work when time permits and am happy to change earwires on earrings (free if the same quality - if moving from silver-plated or gold-plated to sterling or 14kt gold-filled, price will cover the cost of my materials) or do repairs for a nominal fee. Custom pieces can be created for a nominal fee of $2.50 each beyond normal listing price on eBay. 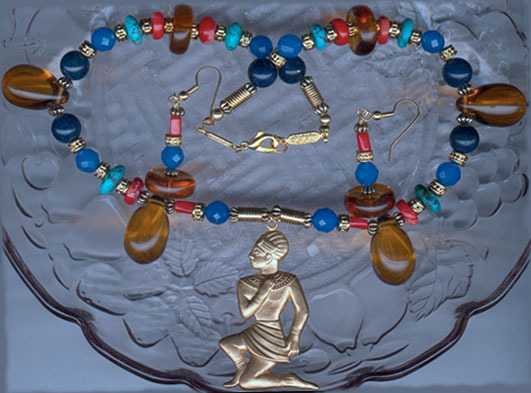 Shipping is listed with each item, but items can be combined with reduced shipping of .50 each on additional items after the first/heaviest and can also be combined with eBay auction items from my seller's list. .
Beautiful matching necklace and earrings of multi-gemstones, including coral, turquoise, amber, lapis lazuli, blue onyx (faceted), and vintage/antique amber glass, with gold-plated brass beads. Genuine gemstones mined from the earth. Exquisite set!! Wonderful gift idea! Earrings are 14kt gold-plated French wires measuring 2" long by 5/8" wide - can switch to 14kt gold-filled French wires for $1 additional. 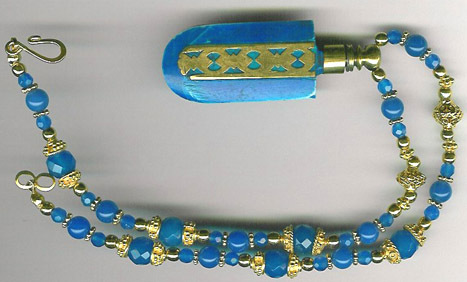 The necklace is 17" long and features a 14kt gold-plated brass pharoah pendant (2" by 1 3/16"). It has a large lobster claw closure. There is a lot of carat weight in these beatufiul genuine gems!! Beautiful on the neckline. PRICE: $55.00 plus $3.00 shipping. TOTAL - $58.00. 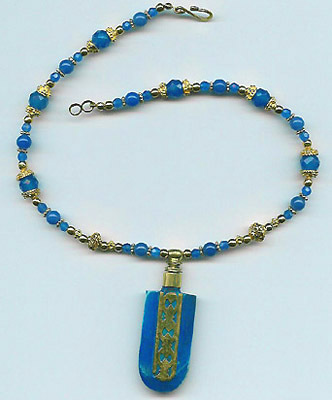 Here is a lovely and very unique necklace of genuine faceted and round blue onyx gems, with 14kt gold-plated round beads and fine Bali vermeil (22kt and 24kt gold over sterling silver), large filigree swirled beads, knobby beadcaps, and little dotted beads - all gold vermeil. I then suspended a perfume bottle pendant of blue horn with brasswork and a brass stopper which unscrews to allow you to fill it with your favorite scent!! Special and unique gift!! Take a look at the back of the pendant. Side view below this image. The perfume bottle pendant measures about 2 1/4" long overall including the stopper by about 7/8" wide. 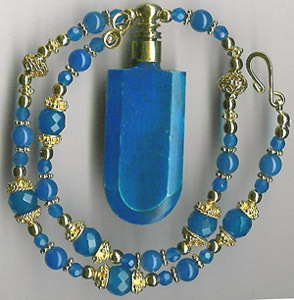 The blue onyx beads measure 4mm (faceted round), 6mm (plain round), and 8mm (faceted round) and complement the color of the horn bottle perfectly. The necklace is made to fit close to the neck; it measures 15 1/2" long and features an "S" and figure 8 closure. Very pretty and unique necklace!! Lots of gem weight and gold vermeil. One of a kind. Gorgeous bracelet with genuine hard-to-find amazonite gemstones in large carved swirl beads, with antique gold-brass filigree beads between. Beautiful big bracelet. The bracelet was made on memory wire to retain its shape without needing a clasp. Fits 7" to 8 1/12" wrist. 1/2" wide. 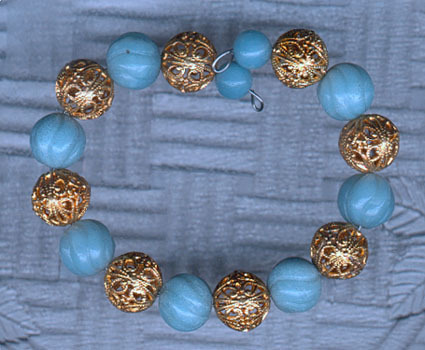 The amazonite and the filigree are both 12mm in diameter. Beautiful! Do not have duplicate; one of a kind. PRICE: $19.00, plus $3.00 shipping. TOTAL - $22.00. 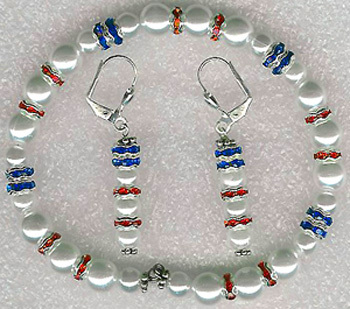 Gorgeous earrings and matching bracelet in the most beautiful patriotic USA pride set you will find! I have used lovely glass pearls with fine Austrian crystal fancy scalloped rondelles in ruby red and sapphire blue, with Bali sterling silver flower spacers as a finishing touch. Very beautiful, classy treatment. The fine sparkling crystal rondelles are 6mm in diameter and the glass pearls are 6mm and 8mm. The bracelet has been made on memory wire so it is cuff-shaped and needs no clasp. It was made to fit most wrists, is about 8" long and will accomocate from 7" to 8 1/2" wrist. The pretty heart-design silver-plated leverbacks measure 1 5/8" long by about 1/4" wide - very pretty earrings. Lovely set - great gift idea for those who have loved ones in the military! PRICE: $27.00, plus $3.00 shipping. TOTAL - $30.00. HERE is a pair of earrings made with vintage gold brass filigree and Czech black with roses wedding glass lampworks - very unique. French wires. 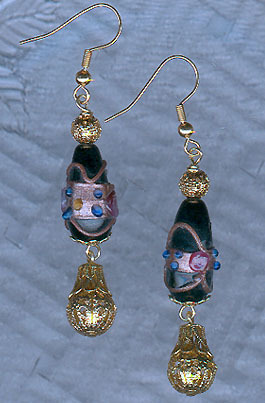 These earrings measure 2 1/2" long with the filigree dangles - statement-makers! 14kt gold-plated French wires. Top filigree is 6mm in diameter. The bottom ones are about 10mm in diameter, with the width of the wedding glass being 12mm, length, 20mm. Lovely, different look. PRICE: $12.50, plus $2.50 shipping. TOTAL - $15.00. Genuine tanzanite and sapphire gemstone earrings! 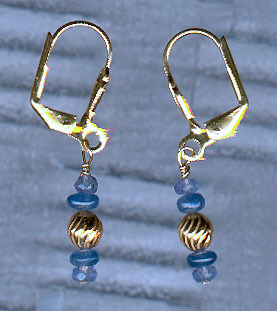 All genuine gems in the loveliest blue shades imaginable - a delicate and dainty pair of earrings!!! Very ladylike. With golden swirl beads between the tanzanite and sapphires, these are the ultimate in femininity. Fancy 14kt gold-plated, shell-design leverbacks. Beautiful gift!!! The earrings have a drop of 1 14" long overall by 3/16" wide. Do not expect these to be large - they are not. Precious gem beads are most often tiny. The sapphires are 4-4.5mm in diameter and the faceted tanzanites are 3mm. Gorgeous!! Each jewelry creation I make is unique, like having your own custom jewelry designer! PRICE $13.50, plus $2.50 shipping. TOTAL - $16.00. Very unique, different earrings for an individualist! 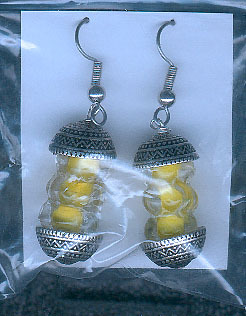 These earrings feature large, Bali-style antiqued silver beadcaps embracing unusual yellow Czech "melting ice" lampwork glass tubes. Hung on nickel silver French wires to match the color of the beadcaps. These earrings measure 1 3/4" long by about 7/16" wide. These are definitely for somene who loves "different" things! Not for the traditionalist! PRICE: $11.00 plus $2.50 shipping. TOTAL - $13.50. Perfect clip-on earrings to go with navy!!! 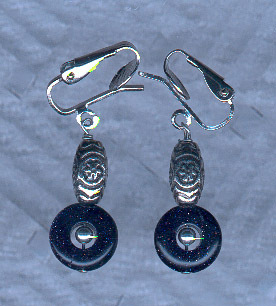 I made these with lifesaver beads of genuine blue goldstone which has sparkles throughout it! Silver floral motif beads, with sterling silver balls in the center of the goldstone, make these special. Findings which look like pierced, but are really Clip-ons! These earrings measure 1 1/2" long by 7/16" wide. Classic color comination in these! PRICE: $11.50, plus $2.50 shipping. TOTAL - $14.00. 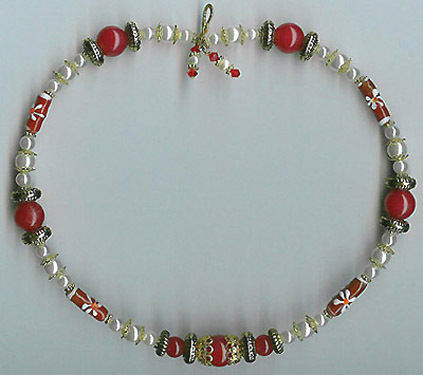 Lovely necklace made on memory wire with a dragon hook and eye closure, with genuine red jade 12mm round and 8mm round gems, nice glass pearls in 8mm and 6mm sizes, handmade red and white floral lampworked glass tubes, fancy antiqued gold-brass textured beads, and dangles at the ends of Siam Swarovski crystal and genuine little freshwater pearls. 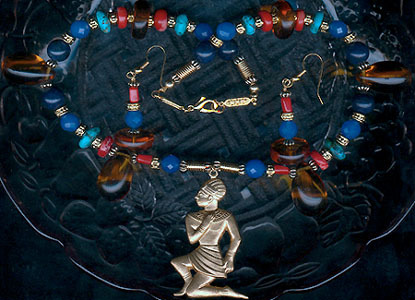 The entire necklace measures approximately 17" long without the dangles and is about 1/2" wide. The little dangles at the ends measure about 5/8" each and give the piece a nice finishing touch. Very pretty piece on the neckline. PRICE: $25.50, plus $3.50 shipping. TOTAL - $28.00. 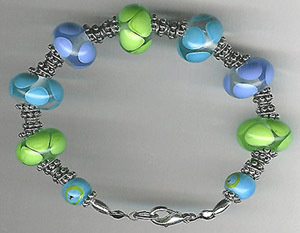 Here is a beautiful bracelet I created with gorgeous lampworks in spring colors of lime, aqua, and periwinkle dots over a clear base made by Barbara Gumeson with two round imported Czech aqua lampworks. Then I added large Bali sterling silver double beadcaps (8) with Bali sterling flower spacers (18) and two 14kt white gold-filled fluted tubes at the end. Lots of Bali sterling silver. Finished with a lobster claw clasp. This lovely bracelet measures about 8" long by about 5/8" wide, but it wears like a 7 1/4" to 7 1/2" bracelet because of the size of the large lampworks. The lovely lampworks measure about 18mm in diameter by 11-12mm thick, and the vintage imported round lampworks are 9.5mm. Absolutely to-die-for! PRICE: $52.00, plus $3.00 shipping. TOTAL - $55.00. Please view my Ebay auctions! 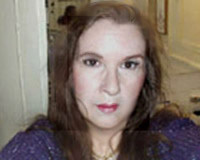 Content © 2005, Janet Snider Parris.